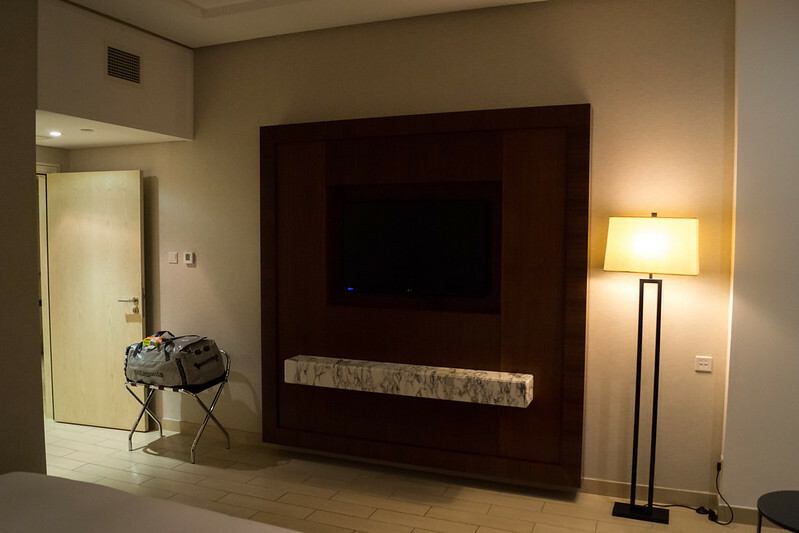 Dubai…it really does have more lodging options than you could shake a stick at. With all of the major brands having many multiple hotels in the city and surrounding areas, you won’t find a shortage of any type of property; whether you want a beach resort, towering luxury hotel, or a basic budget accommodation, there’s plenty of rooms available. To that end, that meant that deciding on a hotel was going to be a little bit difficult for me. 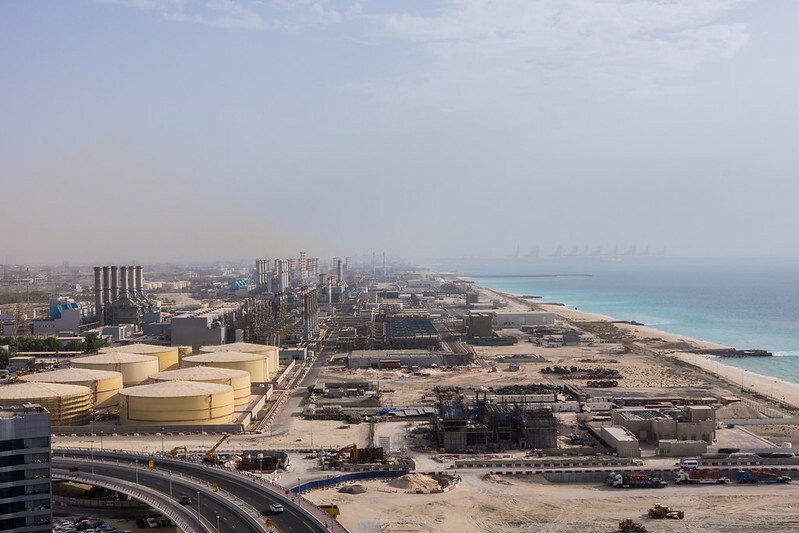 There are 13 hotels affiliated with Hilton HHonors while 18 are affiliated with SPG within or surrounding Dubai (each brand has several new properties in the works on top of that set to open in the future). Also considering that I was going to be visiting in the middle of the summer, most of the room rates did not seem super terrible. It was after all the point of the year where temperatures during the day hit triple digits regularly, making it even a bit hot for the beach, in this Floridian’s opinion. 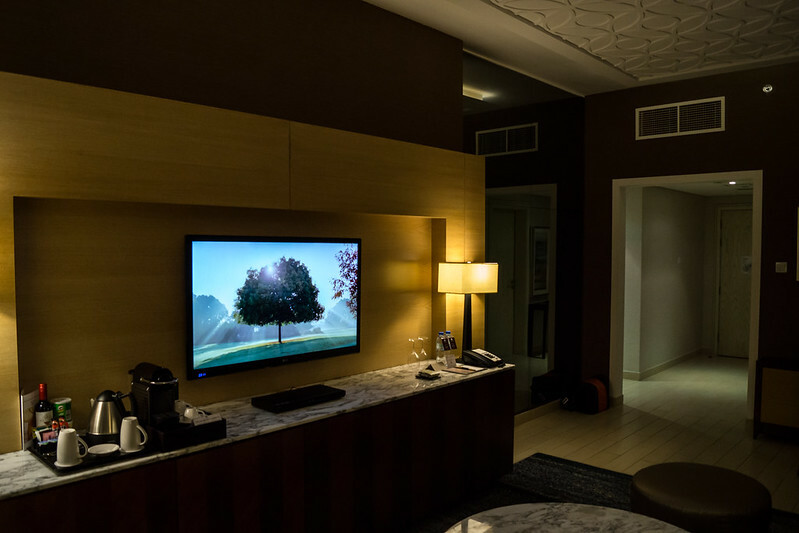 That being said, the options were quite wide and varied and with many hotels have both points and cash + points availability this complicated the decision-making process further. 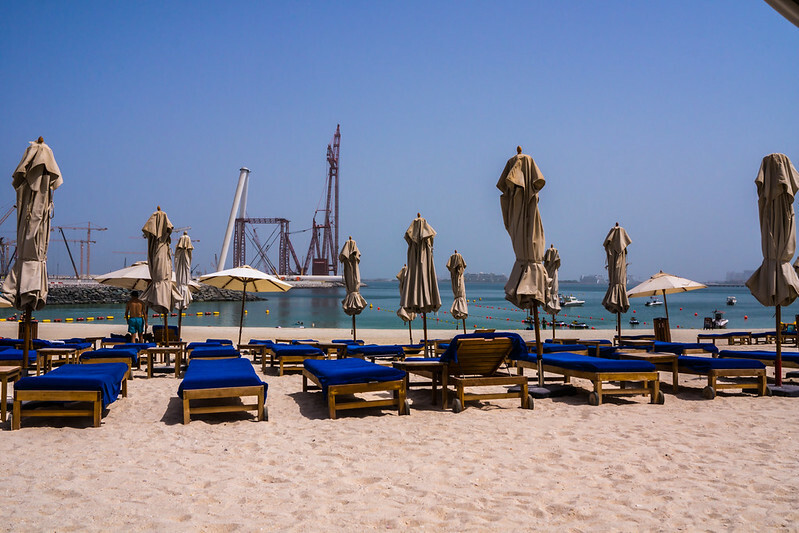 As I looked over my options a thousand times, I had eventually narrowed my options down: Grosvenor House Dubai, Conrad Dubai, Hilton Dubai Jumeirah Resort, and the DoubleTree Jumeirah Beach. Obviously, you can tell which one I picked based on the title of this post, but why did I pick a DoubleTree over the others, especially with one Conrad property and one SPG Luxury Collection property in the mix? 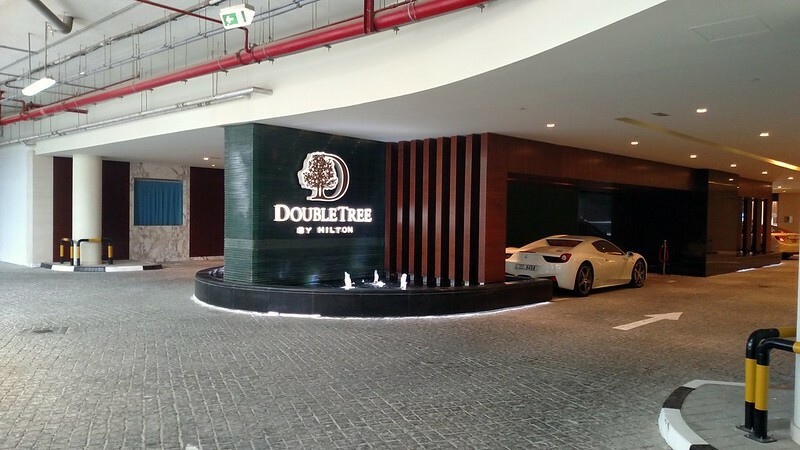 The answer in the simplest of terms was that, by booking the DoubleTree I could guarantee a large suite and at a rather low cash and points rate of 238AED + 16,000 Hilton HHonors points. That right there was a steal as far as I was concerned. 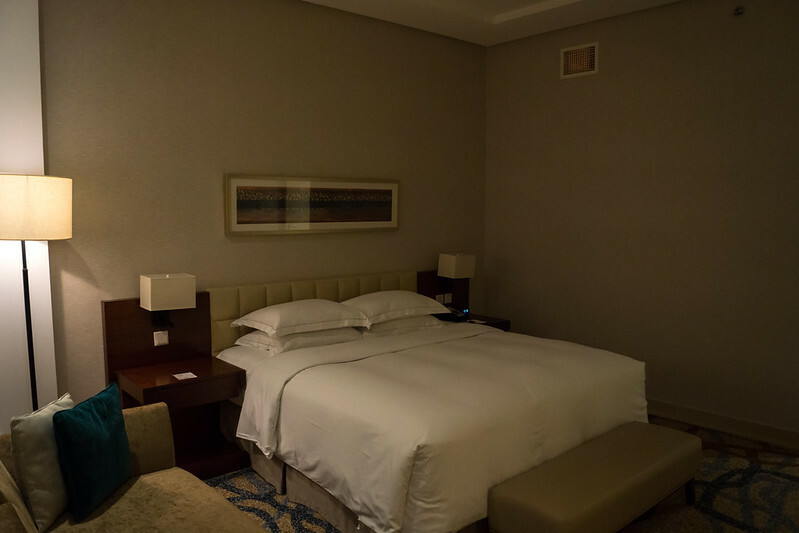 Considering that I also was going to be landing in Dubai after 1AM, and leaving likewise in the middle of night I thought it might be good to book the room for both of those nights. This way I could check into the hotel and get a few hours of sleep before tackling my first day in Dubai and allow a place for me to wash up after a full day of walking around in the heat prior to going back to the hotel. The other options would have all cost me more and there would not have been a guaranteed suite for me. The Grosvenor House was going for just under $300/night at the time which would have been silly to pay for the two partial nights and the Conrad likewise was going to be a few hundred more for that privilege. Considering the length of my trip, it seemed prudent to find a few savings here and there. With my flight having arrived just after 1AM, the long queues at immigration, and the long taxi ride to the hotel, it was after 3AM by the time I reached the hotel. As one would expect from an arrival at this hour, I was the only person wanting to check-in, which certainly made that a breeze! The agent who took care of me was able to get me processed and actually thanked me for putting a note in my reservation about my planned late arrival (which I thought was odd, but hey if that made things somehow easier for them…). Even at that hour there was porter on hand and given how tired I was I did not put up a fight when they offered to cart my bag up to my room for me. One thing that I will go ahead and note here is that the entrance to the hotel is through essentially the car park in the base of the building, without there being a well signed exterior entrance on the ground level. Arriving by taxi or car isn’t an issue as they will drive up the ramp to the car park entrance, however if you are walking around it may be a little tricky. Either walk up the car ramp, take a cut through the residential towers (one security guard let me do this, another didn’t) or find the side entrance near the restaurant on the side (not signed at all). 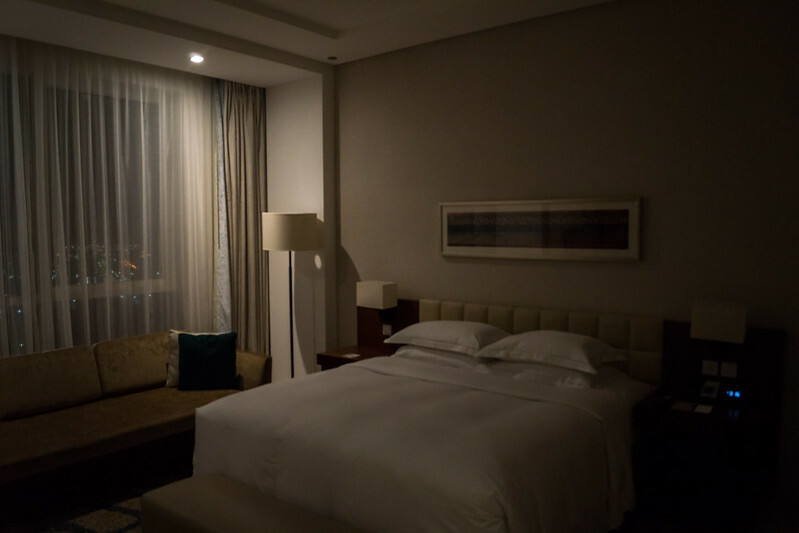 That may be really the only thing I can say that is negative about the hotel – especially considering that being at the end of “The Walk” you’ll probably want to be able to easily walk to the various shops and restaurants nearby. I reserved a “King One Bedroom Suite With Balcony” which promised 947 sq ft, views of the marina, and more. My room was located on the end of the hallway, giving me all that plus at least a corner. Being in the middle of the night and slightly jet-lagged, I wasn’t sure what my room exactly opened out to, so I just checked out the interior before collapsing in my bed. 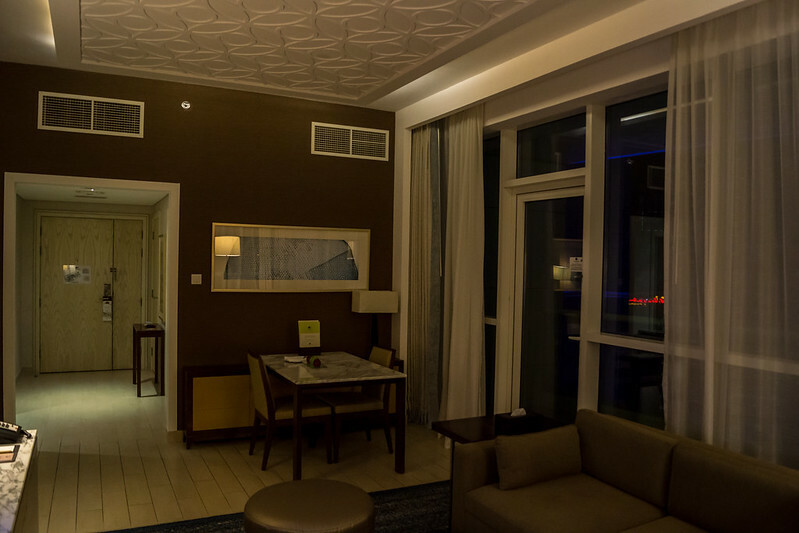 Upon entering the room you find yourself in an entry way which splits into the living room and over to the bedroom. Between the bedroom and the entry way there is a small bathroom that I assume would be for any guests that you might have over as it lacked a shower. The living room featured plenty of space to sprawl out, a decent sized dining table, and all the other usual hotel room amenities. With the room being on the corner, the living room featured two walls that were floor to ceiling glass; one of which faced the patio. The one thing that I was glad to see was a Nespresso machine, however they were extremely stingy on Nespresso pods. I think they left 2 or 3 for free and if you wanted any more you had to have housekeeping bring up more for a charge. I should note that after my first use it was not refilled either. 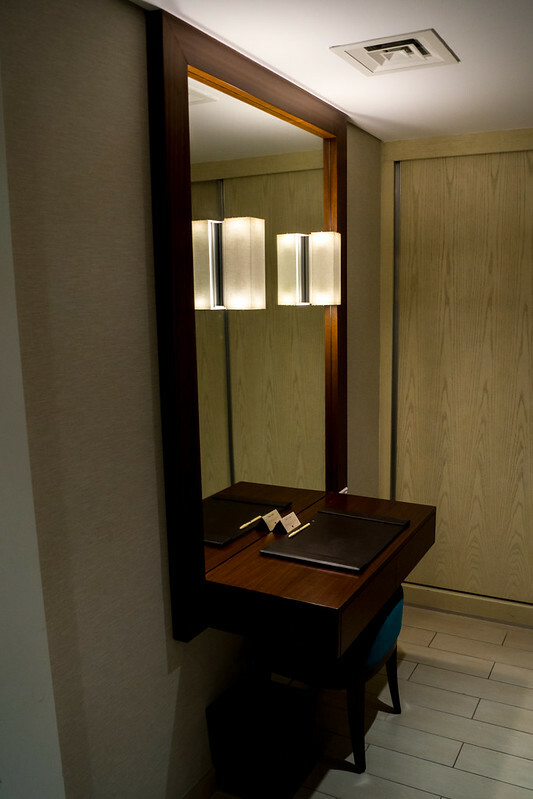 Over on the bedroom side of the suite, after passing the guest bathroom is the entrance to the closet, main bath, and vanity. 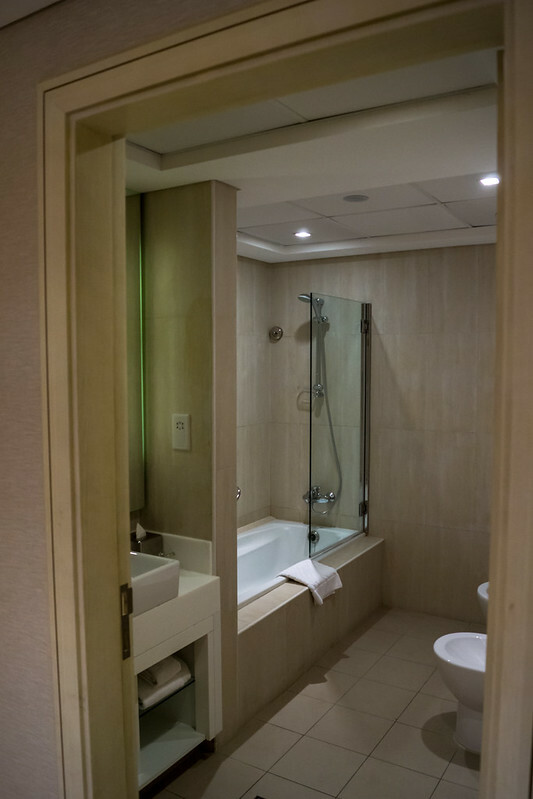 The bathroom wasn’t super spacious or overly luxurious (unlike some other suites I’ve stayed in, including the DoubleTree San Diego Mission Valley’s Presidential Suite), but more than satisfactory for my needs. In the bedroom, there was a King Bed, sofa/lounge, TV mounted to the wall, and more floor to ceiling window action. The bed was perfectly comfortable, although not quite as comfortable as the W Bed…but it could have been as hard as a rock and I would have fell asleep that night! The DoubleTree offers a few options for dining on the property, although there is plenty within walking distance as well. 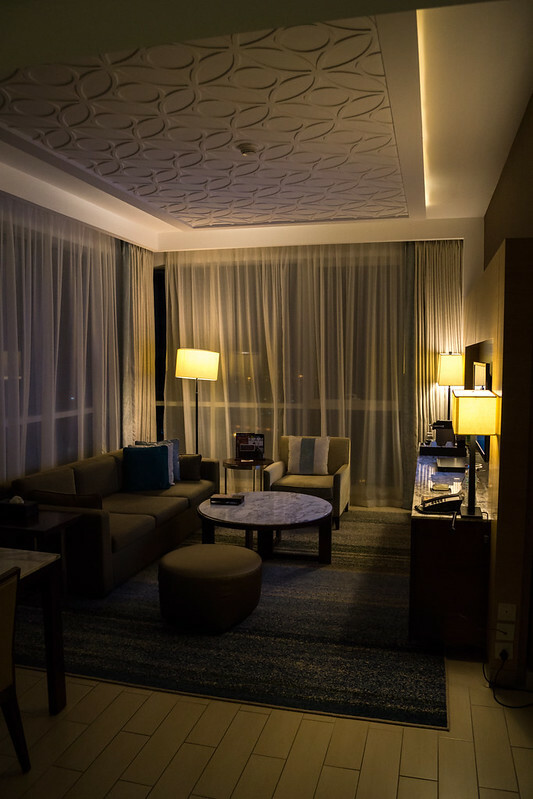 These options range from The Kitchen Table, to the outdoor poolside Areia Beach Bar & Grill, the upscale Al Maeda, and the off-lobby Maiya Lounge which never seemed open. I myself had tried the first two options, but not the second two. I ate breakfast at each of the mornings at the Kitchen Table, which had a a pretty decent spread covering all the various tastes of breakfast. From American to European to Asian, it was all represented. The breakfast was free, which I am unsure if it was because I had selected that as my on-property benefit for being HHonors Gold at the time or if it just happened to be included in my award rate (I also got the 1,000 points so…). My only complaint about the Kitchen Table is that getting service for a drink top off could be a bit spotty. Trying to flag a server could prove tricky, especially if you sit outside as I had one morning (there’s plenty of indoor seating as well). Overall the food was pretty decent. As or the Areia Beach Bar & Grill, I opted to have dinner here one night as I just wanted “the easy choice”. 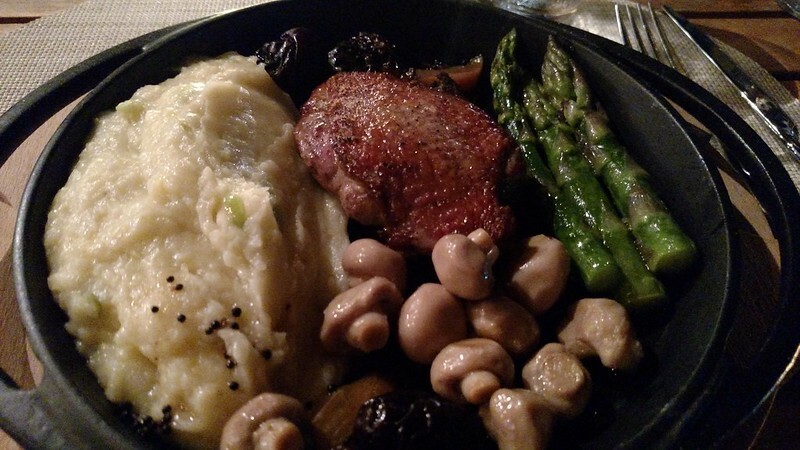 I can’t say I remember much about the meal (I think it was Duck? ), but I can say that I do remember the $10 beers. Of course that is relatively par for the course in Dubai considering how heavily alcohol is taxed. 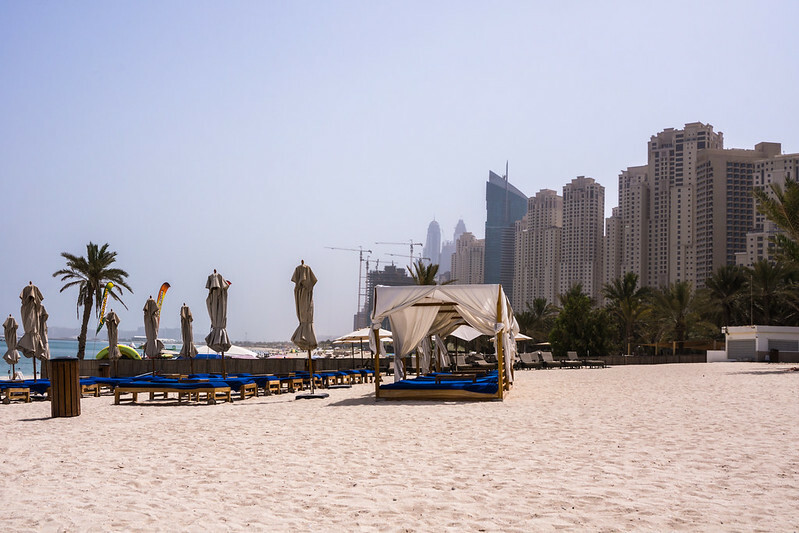 Odds are that if you are staying at a Beach resort property in Dubai, you’re more than likely there to take advantage of the beach. 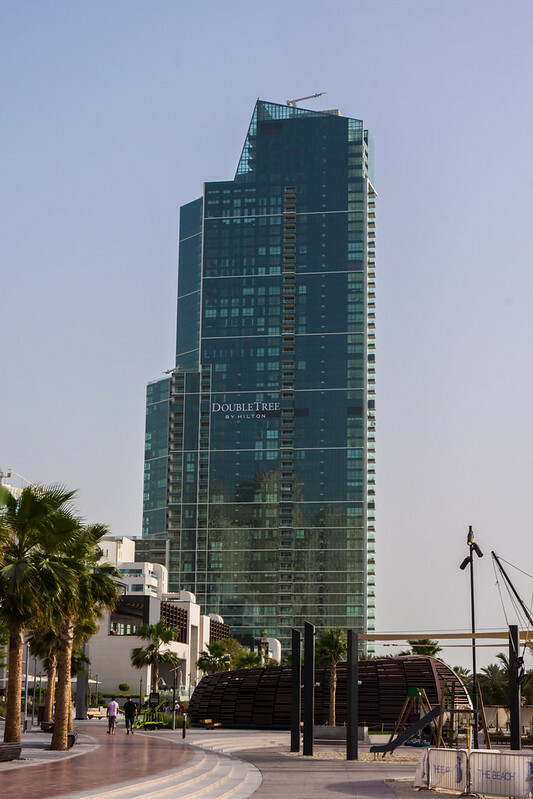 The DoubleTree is located at the south end of Jumeirah Beach and “The Walk”, which consequently is also where the beach ends. At the time of my visit, there was also a massive effort to reclaim land off the beach, so that perfect beach view was interrupted by the sight of dump trucks and this tall structure that I assume is there for the sucking up of sand from the sea floor to make new land from. So, not quite a majestic beach view. However, they have taken to putting out a variety of chairs and covered lounges out on the sand, which is great. Even mid-morning when I went down after breakfast it was beyond toasty and at least having the shade of the cabana was definitely welcome. 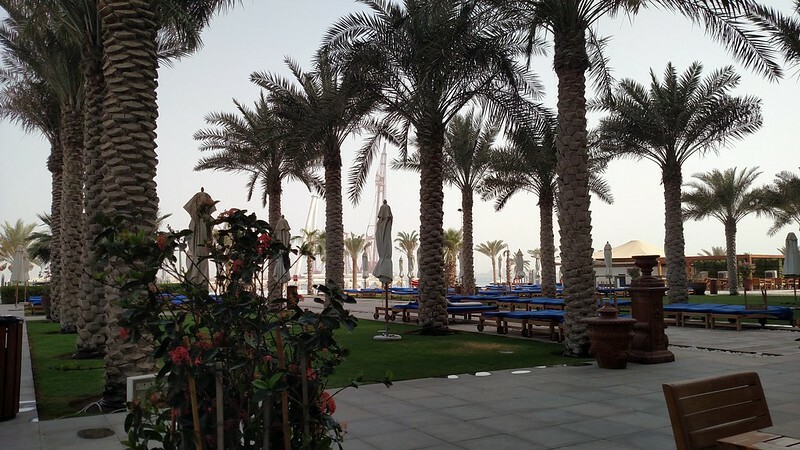 Was the DoubleTree Jumeirah Beach able to become my most favorite hotel? No, not quite. 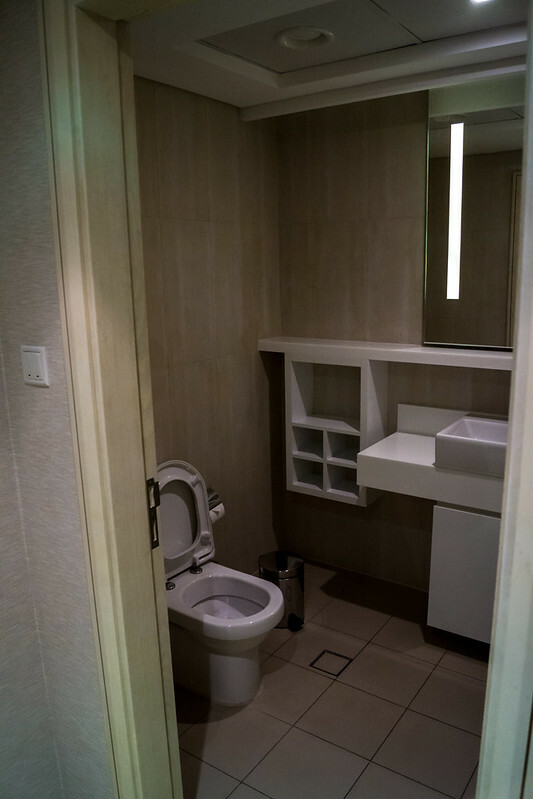 As usual though, I found it to be a pretty decent hotel – it had its shortcomings as all properties do. But was it absolutely good for the value? Absolutely! The size of the room, which was larger than my old apartment was definite a winner. Was the breakfast good in The Kitchen Table? Absolutely! Did I get solid service from the property staff? Again, I did. Really the big hold-up with this hotel for me is location. The lack of easy access for walking up to the hotel and being on the far end of The Walk, puts it on the edge of the action versus as being in it. Some people may prefer it, as it would probably be quieter and perhaps easier for families. You’ll be further away from the airport and the malls and most attractions. After all it did take about 30 minutes of racing through the dead night to go from the airport to the hotel. I think on a future trip I would like to try out one of the luxury properties that I passed up, that are more centrally located. But if you are looking for a solid mid-range property that is spacious, but are on a budget, I would definitely say to stay here. 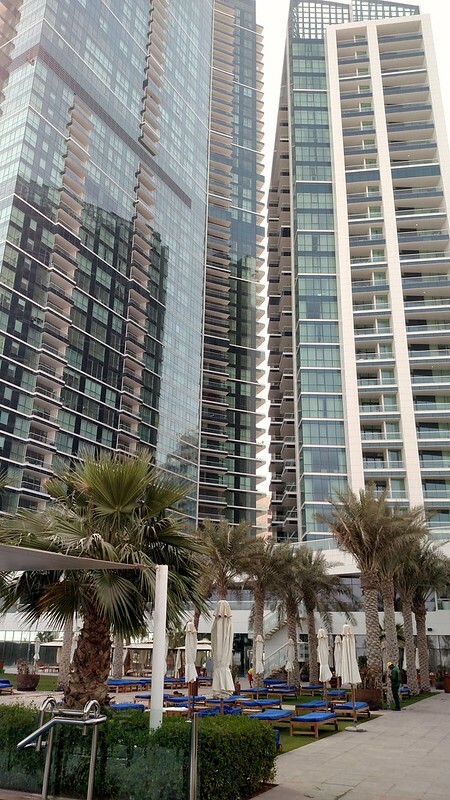 This entry was posted in Dubai, Hilton HHonors, Hotels, RTW, Travel, Trip Report. Bookmark the permalink. Follow any comments here with the RSS feed for this post. Post a comment or leave a trackback: Trackback URL.